An extremely flexible yet durable and strong TPE and nylon based material. PCTPE was designed to be both highly flexible, yet retain the durability of nylons. Single perimeter parts can be wadded into a ball, yet are difficult to stretch out of shape. With a lower printing temperature than our nylons, PCTPE easily prints on "Any" 3D printer at only 225C - 230C. While extremely flexible the nylon insures 1.75mm line is no problem for direct drive or bowdens feed systems. That determination was made by our testers as every sample of PCTPE sent out was 1.75mm. From AOSmith Industries: PCTPE is ridged enough to hold its shape when welding yet flexible enough that it wont snap or break when the workers bump it against the table or apply side forces to handles. Excellent bonding even at 0.3mm nozzle size. 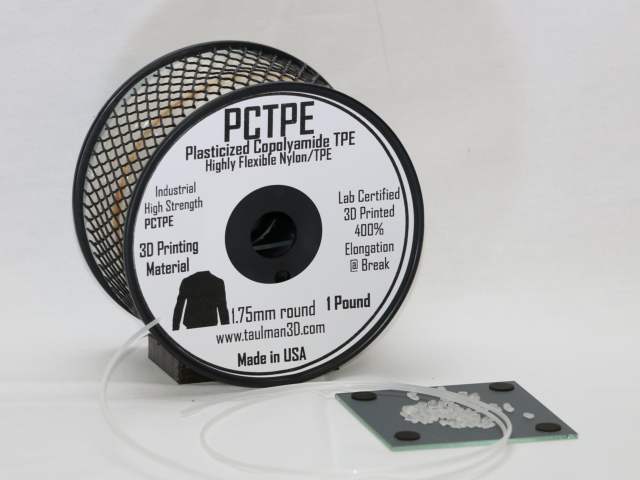 We are today releasing our new highly flexible 3D Printing material called PCTPE. PCTPE stands for "Plasticized Copolyamide TPE" or a chemical co-polymer of highly flexible nylon and TPE (thermoplastic elastomer) . PCTPE has several unique features that allow any user to print a highly flexible part with the added durability of our nylon polymers. This combination of polymers was developed specifically to allow anyone using current FFF 3D Printers to print parts from durable prosthetics to complete cosplay wearable outfits, cell phone enclosures as well as highly flexible utility/industrial parts. 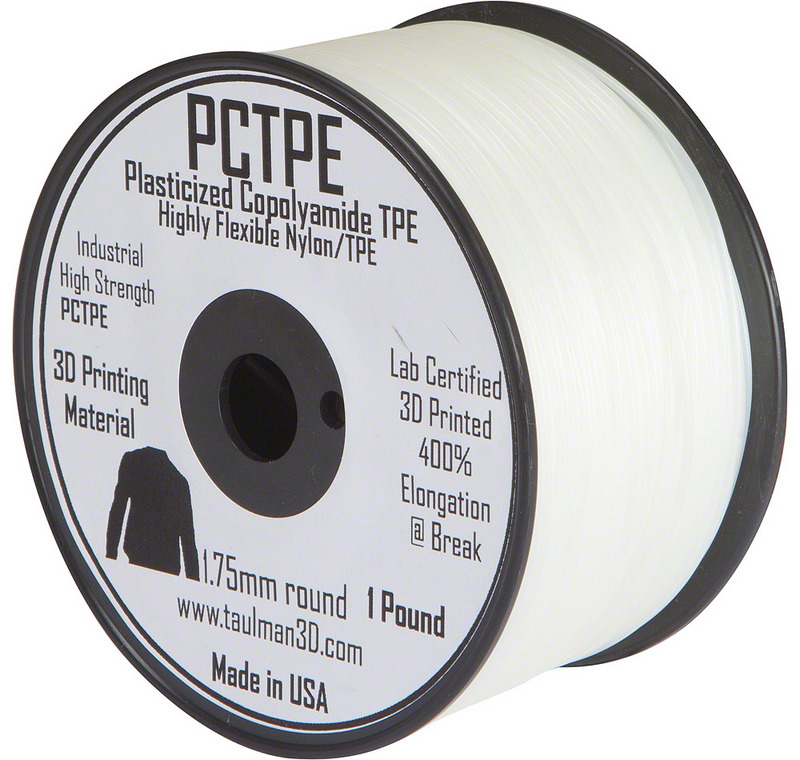 The flexibility of PCTPE means that the end parts will have the smooth lustrous texture of nylon, the added flexibility offered by a rubber like TPE, yet maintain the high durability and non-delaminating benefits of all taulman3D Printing materials. Proven performance = Tested worldwide by the 3D Printing community - summer of 2014. Prints on bowdens or direct drive extruder. = From 1.75mm SeeMECNC "MAX" bowden to LULZBOT "TAZ" direct drive. Super Layer to layer bonding that allows for single perimeter walls to be folded along thread axis. Takes on acid based antimicrobial coatings for footwear and prosthetics. Flexibility - As some users have experienced difficulties with 1.75mm flexible materials, we have worked with our manufacturer to perform an added "draw" process. A process that actually stretches the material during the final mfg stage. This is a similar process used to make large nylon rope for cruise ship docking maintenance. This added stretch increases the tensile properties of the raw 1.75mm and 2.85mm line such that the tendency to fold or buckle is eliminated. Some of our testers remarked that the raw line was actually stiffer than printed parts! This additional process allowed us to increase the percentage of TPE resulting in a material that gives the user a wide range of design flexibility based mostly on the nozzle size, number of perimeters and percentage of internal fill used during slicing. From thin parts that wad up like thin paper to thicker shoe soles with just the right flexibility, PCTPE is an easy-to-print material meeting a long list of requirements from users. Ease of use - The addition of TPE and a new lower temperature nylon, puts PCTPE into the class of slicer software settings most of us use for ABS. 230C print temp and other ABS settings defined by nozzle size and printer type. Super layer to layer Bonding - PCTPE ensures that you do not need to use an enclosure just to get excellent layer bonding of parts from 100mm to 1,000mm+. With PCTPE the layer bonding will allow you to print single perimeter walls and bend or fold along the printed axis without delamination or separation. Wearable Texture - As nylon is known to be a comfortable material to the touch, we made sure that the 3D Printed texture of PCTPE was just as smooth to the touch as any wearable nylon. This lustrous texture is key to making new wearable objects that flow with body movements. In addition to the lustrous texture, the flexibility of PCTPE is more accommodating for complex wearable designs.